My apologies for getting back to you so late. Somehow we missed this question. Render - Hi could you tell me the render colour used ? The render is a toscano roman render. The colour is Orrong. Love the garage door! - Hi there, the entire project looks amazing! Can you tell me where I can source this garage door and what price it is? Thank you! It was a sectional timber door which we painted black. Since this is a heritage-listed building, the architects retained all the original exterior features on the church side, including the weatherboard, Gothic windows and cloverleaf vent. “To be transparent, we wanted to highlight the building, not destroy the facade,” Marie explains. A black stairwell links the church to the new modern building, which contains the master bedroom. 1. 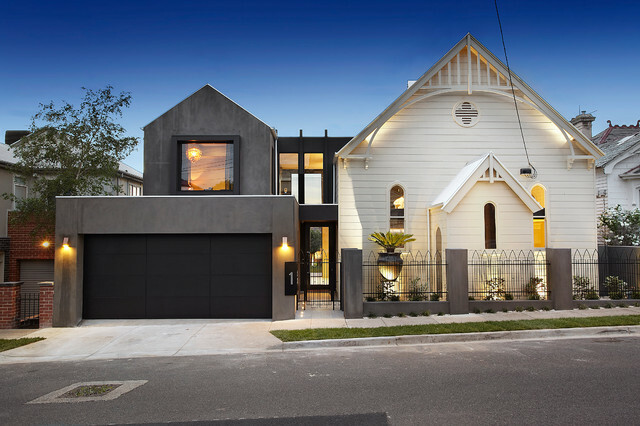 1892 Anglican church conversion in MelbourneThe perfect marriage of old and new, this Melbourne conversion offers open-plan living at its finest. Vast expanses of glass flood the living zones with sunlight, while a clever extension is home to extra bedrooms and a garage. A striking charcoal palette brings extra warmth and drama. Using the vernacular of both residential and secular design, Bagnato connects them using a neutral form that lights up in the evening, complementing the dominant forms without competing with either of them. Kerryn Ramsey added this to What's Your Garage Door Style? 4. Mixing different erasDesigned by Bagnato Architects, this converted church and extension mixes past and present. For continuity, the two sections utilise angled rooflines, and while the box-like garage has a dark, understated effect, it is still a significant part of the design and is framed by two statement lights. The tones of white, metal and charcoal pop up on both sections of the house, creating an almost ethereal effect. DESIGNER TIP: Accent lighting will only work if it is brighter than the ambient lighting. You must have at least three times more light directed on the focal point than the light around it, so that you are fully accentuating your chosen feature. This type of lighting should have ‘hard’ edged shadows so that it creates contrast and in turn a dramatic and outstanding effect. Understanding fees goes hand in hand with understanding what level of service you require. Do you simply need your ideas turned into professional drawings so that they can be approved for construction or do you need a full design service that may also include contract administration, where the architect deals with the builder throughout the course of the build? There are many levels of service in between and the difference in fees can be tens of thousands of dollars, so it pays to be clear on what services you require. If you are unsure of the options available, don’t hesitate to ask. Then, when you receive fee proposals, make sure they clearly articulate the services being offered and the deliverables. i like the treatment on the grey house. could we do this (in a lighter, more taupe/grey tone, for the stucco panels?